An antibody is a protein produced by the immune system to defend the body against foreign bodies, and particularly bacteria. Antibodies are secreted by cells called plasma cells, which are derived from another type of immune cell called a B lymphocyte or B cell. Antibodies are large glycoproteins (proteins with attached sugars) called immunoglobulins. They consist of two identical heavy chains and two identical light chains, joined by interchain bridges (see diagram). Each light chain is composed of a variable half and a constant half. There are two families of light chain, kappa and lambda, which differ in the characteristics of their constant portion. Heavy chains are composed of a variable fragment and three or four constant domains that define five families or classes of Ig: IgG, IgA, IgM, IgD and IgE. A given B lymphocyte and the resulting plasma cell produce and secrete only one type of antibody. Each antibody has a characteristic binding site through which it binds to its target, i.e. the antigen that it recognizes. 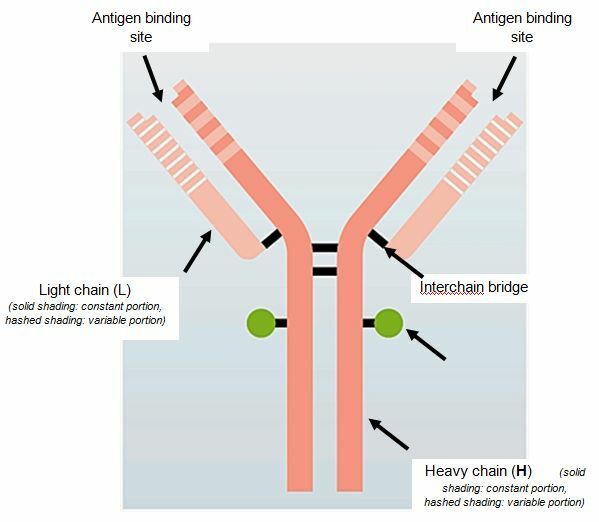 Each Ig has two identical antigen binding sites, formed by the combination of the variable portion of one heavy chain and of one light chain (see diagram). Diagrammatic representation of the structure of an immunoglobulin (Ig) molecule. The two light chains and the two heavy chains of the same Ig molecule are always identical. The light chains can be of one of two types, kappa or lambda and the heavy chains can be one of five different types, which define the different Ig classes: IgG, IgA, IgM, IgD and IgE.